This is my summary of the meetings of the Mission Springs Water District Board of Directors on February 14 and 19, 2019. President and board members, Jeff Bowman, Living Waters Spa. I apologize up front, I'm recovering from pneumonia. Steve Grasha, last month I revealed that you were a liar and that your campaign was built on lies. That if the voters knew the liar that you are, they would never have voted for you. The pinnacle of your lie was when you called me a child molester both on Facebook and an email blast to the voters. But as I pointed out last month, your lies did not start with that. They started with your campaign statement "Technical Water Systems Engineer." This month I want to unravel the truth about you being the chairman of the Riverside County Leadership Forum. Just like with your false claim of being a Technical Water Systems Engineer, your chairman of the Riverside County Leadership Forum is a lie, because the forum is just you. You made it up several years ago. Steve, a real leadership forum would be based somewhere. They'd have an office. They'd have a registered organization either as profit or not for profit with the authorities. They'd have regular meetings and an agenda. Yet you did make a Facebook page for your fake organization. However, dude, you've gotta make it current. The phone number you give fails. Your stated website domain name has lapsed and is for sale. 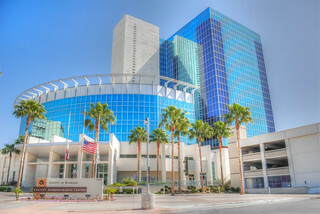 But the real interesting thing to me is that the picture you have is that of the beautiful County of Riverside's county administration center. How more official can you get than that building as your main picture? This shows everybody your forum is real. All right? Yet, you don't hold meetings or anything there. You just make it look like you do with the picture. Then I discovered that you didn't even take the picture. You pulled it from a person's personal Flickr account. Steve, you could not even take your own picture for your own fake organization. You are a fraud. Yet, you use this official sounding, made-up organization to promote yourself. In many of your email blasts and Facebook posts you quoted the forum as supporting you, backing you, recommending you. Talk about having a self-aggrandizing, egotistical, maniac ego. Last month I outed you on the Leadership County Forum. That must have touched a nerve, because on 1/20 you created a post where you go deeper into your previous libelous and delusional statements. I have handed out that post today because you deleted it less than a day later. If the voters knew the real Steve Grasha, they would not have voted for you. Thank you, Mr. President. The photo in question, on Flickr. Photographer: theDarkHalo. Russell Betts spoke next. He wants the board to take some steps to open up their meetings. He mentioned the fact that they meet in the afternoon and that they don't make the audio recordings of the meetings readily available on the district website. He cited a Riverside County Grand Jury report "2012-2013 Grand Jury Report, Riverside County Water and Sanitation Districts, Compensation and Transparency Report" which makes this recommendation: "Water and sanitation district Boards of Directors shall conduct board meetings after 6 pm to ensure maximum participation by ratepayers, and generate maximum public attendance." Mr. Betts asked the board to make the audio recordings available on the website and to shift their meetings to 6 o'clock. Karl Baker came up next. He said he was a little disappointed that complete budget information is not available on the district's website. He said that what is there is cursory. He urged them to be more thorough. He then talked about DWA's decision to go to district elections. The population of Desert Hot Springs should give it 1½ board members. Each district should have about 17,000 residents. He said he was having trouble generating enthusiasm for DWA's second hearing on district elections, which would be a the Lozano Community Center the following Tuesday. He thinks that DWA should divide itself into two boards, one for its retail operations in Palm Springs, the other for its more widespread wholesale operations. We should resist laying out the districts in such a way that each district includes some retail territory in Palm Springs. Pamela Edmondson had some questions: Would her water bill come on time this month? Is there any way to get less hard water? They just put all new plumbing in their house, but even after a week, the water still smells like paint. A plumber said it was due to their trap. A staff person was directed to speak to her at the end of the meeting. MSWD has been using Brownstein Hyatt Farber Schreck for lobbying services for almost two years, specifically to deal with the Sustainable Groundwater Management Act. The contract is for $10,000 per month. Approved 4-0-1 with Director Grasha abstaining. He did not say why he abstained. TKE provides engineering services to the district. The contract is not-to-exceed $250,000. The budgeted amount for them this fiscal year is $79,400, and they've actually used $38,600 of that. Approved 5-0. These are assessments levied on undeveloped properties that are not hooked up to water or sewer, but have a water or sewer line running in front of the property. The water standby assessment is $26.80 for parcels less than one acre. The sewer standby assessment is $10 for parcels less than one acre. The item before the board now is a resolution to direct the engineer to prepare the list of parcels subject to either standby assessment. Both resolutions in one fell swoop, approved 5-0. You would think a document called "Strategic Plan" would be something that could be found on the district's website (MSWD.ORG), wouldn't you. Go ahead. Try it. The few hits I got all turned up 404. But I did manage to find it, buried in the agenda packet for the June 2017 board meetings. Unfortunately, MSWD scans its agenda packet with the OCR setting turned OFF, so the resulting PDFs are only pictures of the pages. The text within the agenda packets is not searchable. MSWD is just about the last place still doing it this way. The only way to find something in an agenda packet is to open it and read it with your eyes. I extracted the strategic plan and saved it as a PDF on my Google drive, so you could access it much more easily here: the 2017 MSWD Strategic Plan. Maybe the problem is explained in the third item listed under "Purpose of the Strategic Plan." "3. Communicate this information to employees, board members, partner agencies and key stakeholders affected by the District." Did you notice which group is missing from that sentence? Customers or ratepayers, unless they are subsumed under the category of "key stakeholders." Finance Director Matt McCue presented the report. The priority codes (A, B or C) refer to time frames. A = two years or less, B = two to five years, C = beyond five years. Water Supply - three of the A-priority projects are now either complete or in process. The other three A-priority are contingent upon the outcome of the SGMA (Sustainable Groundwater Management Act) process or the litigation with DWA. Infrastructure - of the eight A-priority projects, five are in process or complete. The ones that are not underway are planning related. One of those is "Develop a Technology Plan that incorporates all aspects of the District's internal and external technology, including field operational technology." Financial Management - there are eight A-priority projects. Six of them are complete or in process. The other two have been discussed and are "on the horizon." "Develop a Board Handbook or Guidelines. Components to consider include: role, relationship and responsibility of the Board of Directors and staff, standards of performance and expectations of public office." "Develop a strategy to position the Board of Directors as regional water leaders including elevating their public and professional profiles within the region. The Board of Directors is a resource for the District and the water industry." Organizational Development - all six projects are A-priority and all are complete or in process. Mr. McCue mentioned a report on the Strategic Plan that had been distributed to the Directors via Dropbox. I don't know if it was different from what I found in the June 2017 agenda packet. Director Wright asked if the Strategic Plan is on the website. "It's in the packet. It's got to be accessible to the public, right?" "Correct," was Mr. McCue's technically correct answer. But it was not in this month's packet. It was distributed to the Directors only via Dropbox. And damn me if I could find it on the district's website by any means other than tediously reading document after document. Director Sewell asked which of the Infrastructure projects had not been started. One is described above. The other one is "Conduct an evaluation of alternative energy opportunities including cost and feasibility for each alternative." President Duncan asked if Mr. McCue had a checklist of which specific projects had been completed or started. Mr. McCue said he had them in his notes and could provide that to the directors on Tuesday. I wish I had been able to share that with you. The Notice of Preparation for the EIR is going out to the public on Friday the 15th of February. There will be a scoping review March 6. The scoping review will take place at MSWD headquarters, 5:30 pm to 6:30 pm. The district is trying to secure a date when it can make a presentation to the Palm Springs City Council on this matter. The same presentation will be given to the Desert Hot Springs City Council, probably in March. Three items: approval of the minutes for January 2019, the register of demands and board compensation. Approved 5-0. Residential consumption of water is running a little higher than expected. Operating expenses are running about half a million under budget because there have been fewer emergency repairs than anticipated. In addition, the district has about half a million in investment income from CalTrust where the district has more than $30 million invested. CalTrust is not permitted to invest in the stock market. Most of its investments are U.S. Treasury-related. It had been mentioned that the DWA Board would be holding a public hearing on district elections on Tuesday evening at the Lozano Community Center, which generated a little not-agendized discussion of the subject, again. Attorney Pinkney reminded them, again, that it was not agendized, but that if they wanted to discuss it, they only needed to indicate that they want it agendized at the next meeting. As he was saying this, President Duncan made a quick informal poll of the board and got four affirmative nods. Director Grasha's attention was elsewhere. When President Duncan told the attorney that at least four Directors wanted it agendized, Mr. Grasha objected, insisting that it should be a formal roll call vote so that the record would indicate the support was 5-0. Mr. Duncan said there would be no roll call vote. Mr. Grasha, completely failing to understand that he had just voiced his affirmative opinion as loudly (louder, actually) as any other director, continued to insist, but Mr. Duncan wisely ignored him. Consider it a unanimous request, four directors plus one child. Intentionally disseminating or dispersing false information is unethical. In virtually all cultures around the world it is considered lying. The Mission Springs Water District Board of Directors has not voted to establish districts. At last week's study session, we directed staff to add the possibility of districting to a future agenda for discussion or possibly for future action, should we decide to pursue it further. Before we can district, first it must be brought to the Board of Directors for consideration as an agenda item. Secondly, if it is decided to go forward with districting, we must either decide on our own boundaries or hire a demographer, a demographer's firm, to establish district boundaries. Thirdly, we must hold I believe it's up to about five total public hearings on the topic and take public input before we can district. Then and only then can it be brought to the board for a vote. Along with transparency, we must be accurate and honest in our dealings with the public at all times.